With the following I want to change the theme of my contributions and go back in history just a little way and recount my change of jobs from Med. Chem. to Chemical Development followed later on by some posts on my development adventures but firstly a bit of background. I remember when one of my compounds was selected for development. It was quite exciting at the time, my first development compound, it was also my first brush with the people from chemical development, who, I knew were there, but I never really thought about it, until that fateful day when the compound was selected. As probably every company has we had a standard package which was turned over to these curious people at the other side of the company site, about a 15 minute walk from my lab or 5 minutes with a departmental bicycle (which was an old military reject and had a fixed wheel, no gears and weighed a ton). I set off like one of the Biblical Magi with all the gifts of paperwork and samples, including 1kg of my precious development compound. The person to whom I gave this package to would not accept the kilo sample. He said “I’ll take it but only for lab use”, when asked “why?” he said, “it was not manufactured under cGMP conditions and anyway belonged with pharma drug supply management and as such could not be utilised for anything except normal lab work.” Well that deflated my ego a bit, so I left him with 10g, for lab use, and took the rest back. I found out later that this being was in charge of running the GMP storage facility, in collaboration with the other department, which explained his reticence in accepting my wondrous gift(s). A few weeks later I got a call from the chemical entity who was developing my compound, “would I like to have a tour round the pilot plant?” Of course I said yes and got on my heavy bike. My God was I impressed, lots of huge reactors, centrifuges and plastic (not glass) windows with holes in within the safety cells. When I asked why are there holes I was told that it stops the plastic from bursting all over the place in case of an explosion and directs the blast wave towards the outside. Oh! To be seen was lots of piping, valves, control consoles and the like, with the bottom two-thirds of reactors protruding from the ceiling like some kind of monster upside-down mushrooms. One lasting memory was just how clean the whole plant was, you could have eaten your dinner from the floor, very impressive. Little did I know? The chemist there made several hundred kilos of my precious development compound and then the compound was axed, as they tend to be, and the whole lot was incinerated. Moving forward in time a few years I found myself in a departmental meeting involved in a “chemical” argument with the boss, never a good thing to have. He was moaning that instead of removing chiral centres in our active series we were putting them in. In retrospect this is probably correct but at the time it lead to more active compounds. Anyway things got quite heated and I left the meeting and phoned the head of chemical development who, in the meantime had become a good friend of mine, and asked him if he had a job for me. Well he said yes, I said yes and a week later I was one of those chemical entities at the other side of the factory site. I joined a group of 4 other chemists and a group leader. They were all great guys very helpful and got me settled in and started working on changing my chemical outlook. I was given 4 stuffed A4 folders full of information about the pilot plant, SOPs, cGMP and so on, but no project! That changed rather rapidly. A compound was dumped in our group’s lap because the another site did not have the equipment to make the quantities for a phase 2 study, we needed around 2000kgs of the drug substance the day before yesterday. I think it was a nine-step synthesis; I was allocated the middle two steps. I do remember the person, for whom I would be making the material (the last three steps), giving me a piece of paper with exact and I mean exact specifications for the compound I was to deliver to him. I don’t recall them but I remember them being very thorough. I thought how in hell am I going to do this? He needed around 3.5 tons of material for his part of the pilot campaign. Phone went, group leader on the end. Went to his office and he handed me the laboratory procedure and pilot plant procedures and said do it. Bear in mind that I had been a development chemist for about a week. The first step was a phenolic alkylation with a 10-fold excess of 1,5-dibromopentane, acetone and potassium carbonate at reflux followed by filtration, extraction and product distillation. The second step was also a phenolic alkylation (of the product from the first step), as before, followed by a crystallisation after a solvent change. Sounds easy. I apologise for the picture quality, but you can see what is meant here. 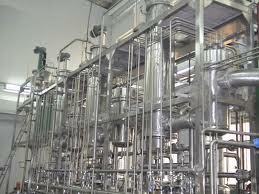 Our distillation bodies were about two meters high and 70cm in diameter, our pump got us down to 10-3mbar. We spent months distilling our 7000 kg of material, to recover the excess 1,5-dibromopentane and eventually get pure product. I forgot to mention that we added carbowax 600 to make the whole mixture less viscous. Actually the distillation was not a problem, it just ran 24 hours a day, 7 days a week. What caused me the biggest headache was the crystallisation of the product from the second alkylation. Based on the procedures I was given I tried it all out in the lab before hand, the compound crystallised nicely from cyclohexane. I don’t remember the quantities but it was done in a 2500 L reactor. So, following my wonderful pilot plant procedure (in which I had remembered to include the anti-static agent), we went to work. It dissolved nicely at reflux; we then had to concentrate it from 2000 L to 1500 L at which point it should have began to crystallise after this the distillation was terminated and the mixture then cooled slowly to 10°C. This all went fine and after 500 L distillate had been collected the soup went cloudy, great I thought, and left the plant to have a well deserved coffee and cigarette. Just sat down, phone goes, “Dr. 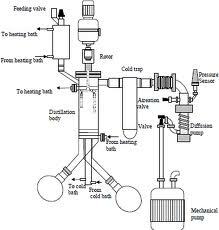 Quintus the suspension has become a solution again, what do we do next?” said a voice. What now? It should be noted here that the pilot plant operators will not do anything without a procedure, as a novice I had the feeling that if I wrote a procedure for blowing their noses, they would follow it to the letter, this, of course, is cGMP at work. Anyway we removed more solvent, no crystallisation, went down to a volume of 1000 L no crystallisation. Obviously the mixture was supersaturated; at least that’s what I told them. Off to the lab, back with one seed crystal, heaved it in at 25°C, the whole stupid mixture solidified instantly! There was a sort of sickly crunching noise as the stirrer stopped. The crunching noise was the sound of the enamel cracking. Luckily I did not bend the stirrer, but I think that may be a bit harder to achieve, it was bad enough. We eventually added a bit of THF and slowly warmed the mixture up and the solid re-dissolved and it was transferred it to another reactor. Now I don’t know if you have seen one of these reactors, there is miles of glass attached to the top of it, not to mention condensers, probes, stirrer motor. The lid is attached to the main body with what seemed like thousands of big nuts and bolts, and the whole lot weighs hundreds of kilos. Needless to say I was not very popular with the pilot plant boss. It took them three weeks to dismantle the reactor replace the stirrer and put the whole lot back together again. But never mind, the good news was that I got my yield, plus a few glass splinters, and the compound met the specs I was set, the glass did not interfere in the next step and was removed by a simple filtration. This may seem trivial now but at the time I got really, shall we say, worried that I would not produce the goods but as it turned out this was nothing. So that was my first foray into the magic world of chemical development. There is a lot more to tell but that is for another day. Of course, if you all wish to read it! Fantastic! Please post more stories and insights! Remember you asked for it! I felt that after getting a Ph.D in organic synthesis that it was assumed that you’d look for a job in drug discovery. Process was not really talked about much. Yet,in hindsight, the challenges of process chemistry are much more appealing to me. I wish I had had some guidance to direct me towards that. That will come in the next post, briefly, process lets you use your chemistry, all that you learned. Some may think it is boring to optimise, doing the same experiment day after day, but it is amazing just what differences you can see by changing one little variable. And you usually have enough material to see what you are doing. No fiddling about with 1 or 2 mg you can do 1-10g or more experiments if you wish and can isolate all the side products thus letting you figure out what is going on. And if they will make a difference in the next step etc. I hope your seed crystal had been released for use in a GMP batch…? Oh yes, much more please. A fascinating outlook, I’d love to read more.